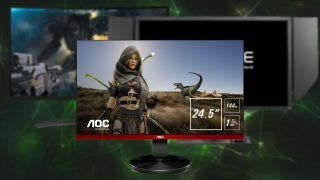 We've sorted the best G-Sync Compatible FreeSync monitors 2019 has to offer. To assess the best G-Sync Compatible FreeSync monitor on the market right now, we must first take a look at the history of the spec. As of this writing, 24 FreeSync monitors are now certified for G-Sync by Nvidia. Therefore, it is possible—on those monitors in particular—to enable the technology in Nvidia Control Panel and effectively put an end to screen tearing once and for all. That way, whether you have a graphics card from Nvidia or AMD inside your PC, you don't have to rely on the software-based vertical sync, or vsync, options often plagued by input lag and microstuttering. Of course, as you may know already, you don't have to own a G-Sync certified FreeSync monitor in order to tick the "Enable G-Sync, G-Sync Compatible" box against Nvidia's judgement. You could just do it and see what happens. In fact, Nvidia has intentionally given us the choice to "enable G-Sync manually for your FreeSync monitor," even if it hasn't been officially vetted. But once you do it, there's no telling what kind of instability hijinks will ensue. Thus, your best bet is to shell out for one of the best G-Sync Compatible FreeSync displays on the market, all of which are Nvidia-approved. Of the 15 monitors authorized so far, we've combed through our top picks, narrowing them down to the uppermost impressive three. Complete with specs, pricing and the crux of our impressions, read on to experience the luxuries of G-Sync minus the exorbitant cost of a native G-Sync panel. Although it does use a TN panel, notorious for its inferior viewing angles and color reproduction, the AOC G2590FX is an affordable path to high frame rate gaming on an almost borderless display. With a refresh rate of 144Hz and an agile 1ms response time, this 25-inch monitor can show off frames fast as your GPU can squeeze them out, no jaggies or input lag permitted. It might look a little bizarre because of its removable "tactical shield" blinders on either side of the display, but rest assured, the BenQ Zowie XL2740 works like a dream for aspiring esports legends. Not only does it have a blisteringly fast 240Hz refresh rate, but it also eliminates much of the hassle of navigating menus by way of a remote 'S-Switch' mechanism. For those who prefer screen that take the shape of our peripheral vision, the Acer ED273 Abidpx leverages a fast and fluid vertical alignment, or VA, panel. So while its response times can't quite keep up with those of the aforementioned TN displays, its viewing angles are suited for the enhanced field of view ushered in by the advent of curvaceous frames.